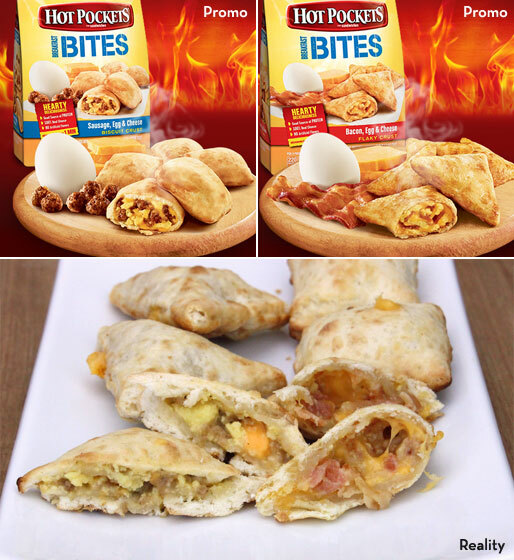 I tried two varieties of Hot Pockets Breakfast Bites: 1) Bacon, Egg & Cheese; and 2) Sausage, Egg & Cheese. They also make a Ham, Egg & Cheese version. These were great little treats... IF you you BAKE them. When baked, the crusts are flaky and nicely crisped. If you microwave them, the crusts are limp with an uneven texture. They take 1 minute to microwave and almost 20 minutes to bake. It's worth the extra 19 minutes to bake them. The sausage variety is surprisingly, pleasingly sweet. It has what they're calling a "biscuit crust". If you made a biscuit that tasted like the crust, you might say, "Dang it. I used too much sugar." But that sweetness contrasts the with hearty flavor of the sausage, egg & cheese and added a little whimsy to an otherwise familiar collection of flavors. In comparison, the bacon variety is more savory with a touch of pepper noticed in every bite. It has a "flaky crust", which is more similar to the crusts of most full-sized Hot Pockets. The bacon has a noticeable smokiness that I liked. The ratio of filling to crust in both varieties is satisfactory. It might not be technologically possible, but a little more filling would have given each ingredient a chance to be noticed. 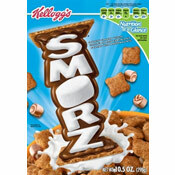 As it is now, you take a bite and say, "That tastes like breakfast" instead of recognizing any star ingredient. Someone in the office commented that these would pair well with a dipping sauce like ranch dressing or gravy. In the end, these are fun, tasty and satisfying... IF they're BAKED. I give this product a 6 out of 7 when baked and a 3 out of 7 when microwaved, which I'll round up to a fairly impressive rating of 5 golden eggs. 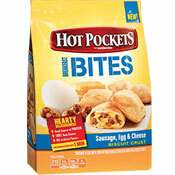 What do you think of Hot Pocket Breakfast Bites?